When I was growing up in the 1950s and 60s, the term “coal miner” conjured up a stereotypical image of a man covered head to toe with black coal dust, wearing a hard hat, and swinging a pick or shovel. The work was grueling, dangerous, deadly, and paid terrible wages. In the United States, a shocking 90,000 men lost their lives in coal mines between 1900 and 1950. If there was ever a line of work that could be called “the widowmaker”, it was coal mining. 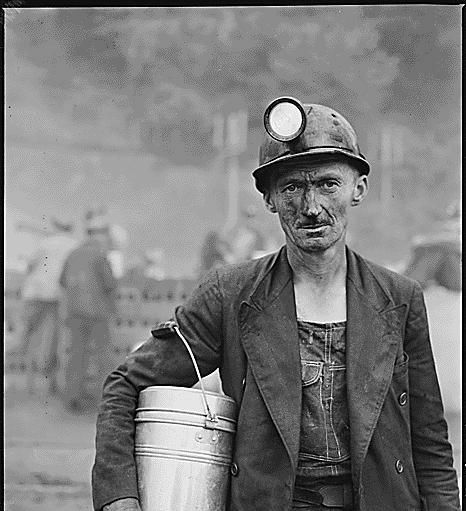 The rest of society viewed coal miners as the bottom of the social hierarchy. You load sixteen tons, and what do you get? Today, coal mining is used as a political football by politicians. Politicians know that it conjures up powerful images that are based on the stereotype I described above. Most recently, President Trump invoked these images repeatedly during his campaign, and it created the desired effect on his listeners. However, coal mining today isn’t what it was in 1910. The above stereotypes are completely false today. Coal mining has changed radically as have the men and women working in that business. President Trump’s rabble rousing was based on fantasy and imagery that no longer exists. Back around 1910, there were thousands of coal mines. Larger mines employed hundreds in each shift. Virtually all coal mining was done underground, not on the surface. This meant entering or descending into deep mines. The standard mining technique was room and pillar, which dates back to ancient times. A room is hollowed out with pillars of coal left standing to support the roof. The size of the pillars was based on the opinions of experienced miners. Sometimes, they were wrong. There’s a tradeoff involved. Making the pillars larger provides increased safety but reduces the amount of coal that can be extracted. Room and pillar is still used today in mines where there’s a valuable enough deposit, like anthracite (hard coal) and surface mining isn’t feasible. However, instead of relying on seat-of-the-pants guesses, science and engineering is involved. The force on the ceiling can be calculated, the compressive strength of the coal deposit can be measured. Optimal column sizes can then be calculated and actual stresses measured so danger can be detected and averted. For added excitement and profit, one can still get the material left behind in the pillars by a method called retreat mining. Once a room is exhausted, the pillars can be destroyed, one by one, starting with the deepest one. The ceiling is allowed to collapse and the coal recovered. Needless to say, this is a dangerous business. My two coal miner friends here in West Virginia do this kind of work. With modern technology, it can be done successfully and accidents kept to almost zero. My friends still come home from work with black faces and clothes full of black coal dust — hard shiny anthracite coal particles that sparkle when you look at them. They use the two washing machines at the laundromat set aside especially for coal miners. Unlike their counterparts a hundred years ago, they don’t use a pick and shovel, are highly skilled, and are paid well. But, they are in the minority. The majority of coal is produced nowadays using surface mining, including the infamous mountaintop removal mining technique. Fortunately for the environment, the number of mountaintop removal permits has dropped to about half of what it was ten years ago. This might be from political pressure, or because coal sales have dropped sharply since 2008. I don’t know. The economic collapse of 2008 started a sharp decline in coal sales that continues today. Demand has dropped. Again, President Trump’s rhetoric about increasing jobs in coal could only happen if demand increases. Coal mines are not gold mines, where the demand is essentially infinite. Coal mines produce only the amount of coal that is needed. Surface mining, which produces the majority of coal today, is done by comparatively few highly skilled workers using gargantuan machines worth millions of dollars each. These machines are so large that you have to see them in person to comprehend. Imagine a bulldozer that could drive down one side of your neighborhood and obliterate every house on one side of the street in a single pass, without the least effort. Or, a dump truck so large that it’s not apparent where the driver is located. You have to climb three flights of stairs to reach the cab. Coal mines of this type employ more people who are mechanics, machinists, welders, engineers, and explosives experts than those who actually do the mining. It’s a whole different world from coal mining in 1910. What’s more, over the next ten years, more of these machines will become robotically controlled with no operator. In twenty years, surface mining will likely be done entirely by computer and robots. Let’s look at some numbers. In 1900 the population of the country was 76 million and the coal industry employed 500,000 men. So, the better part of one percent of the population, or 1 out of every 152 men in the country, was a coal miner. In 1900, annual coal production was about 275 million tons. From 1900 to the present, coal production increased to a peak of almost 1,200 million tons in 2008. In 2008, the US population was about 307 million, and the coal industry employed about 70,000 people, nationwide, or 0.02 percent of the population. In 2008 we had one seventh the number of people producing five times as much coal as we did in 1900. Coal production efficiency per worker is 35 times what it was in 1900. To put these employee numbers into perspective, consider that Walmart employs 1.5 million people in the USA. Amazon employs 570,000. The US Postal Service employs 503,000. The coal industry employs 70,000. To increase production, the coal industry would add a few more machines and a few more employees to accommodate demand. So, to base a political campaign promise on increasing jobs in coal mining is disingenuous at best, stupid at worst. Coal is one of the worst sectors to choose to make such a promise. The number of jobs in coal mining will not increase significantly no matter what happens. The only reason to make such a promise is because it has strong emotional appeal to voters because they still have the old coal miner stereotype in their head and don’t know how things have changed.